Assume a shoulder-width stance approximately one foot behind the weight you’re using, point your toes slightly outward, reach out, and grab the weight with one arm. Start the clean with a forceful hike back of the weight. Up until this point, the movement should be identical to the one-arm swing. When the weight reaches the top of the backswing, snap your hips forward (just like you would a swing). As your hips drive forward, keep your elbow in close to your body and draw the weight up your center line. Do your best to keep the weight as close to your body as possible. The more the weight casts outward, the less efficient the movement becomes. If it helps, imagine you’re trying to zip up a big coat. Catch the weight in the rack position, with your forearm(s) against your rib cage. 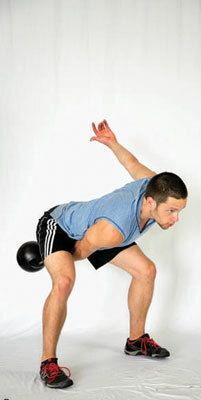 If you’re using a kettlebell, allow it to gently roll onto the forearm before landing in the rack. A common mistake with the clean is to use the arms to curl the weight up. The hips must power the movement. Think about it like this: The hips are the engine, and the arm is the steering wheel. Sometimes the best fix for poor clean technique is to pick up a heavier weight, which forces you to use more hips and less arms and to seek the most efficient trajectory. Most of the time, however, the best way to fix your clean is to go back and fix your swing and one-arm swing.